Our range of products include basketball court maker, squash court, badminton court maker, tennis court and volleyball court flooring. Size/Area Standard Area - 6542sq. 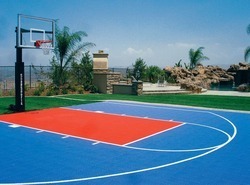 ft.
Sundek Sports Systems is well known Basketball Court Making Company in INDIA, located at Mumbai. Basketball is a team sport in which two teams of five active players each try to score points against one another by placing a ball through a 10 feet (3.048 m) high hoop (the goal) under organized rules. The team having more points at the end of the game wins. Basketball is one of the most popular and widely viewed sports in the world.Disruptive physical contact is penalized and there are restrictions on how the ball can be handled. The diameter of the rim is 18 inches.The top of the rim should be exactly 10 feet (120 inches) off the ground. We are Squash Court Making Company in INDIA, located at Mumbai. Squash is a racket sport played by two (singles) or four players (doubles) in a four-walled court with a small, hollow rubber ball. 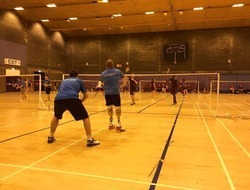 The players must alternate in striking the ball with their racket and hit the ball onto the playable surfaces of the four walls of the court. 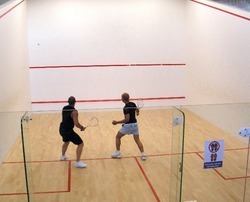 Sundek Sports Systems are well known Squash Court makers. Sundek Sports Systems is well known Badminton Court Making Company in INDIA, located in Mumbai. We develop Badminton Court for commercial and non-commercial purpose. Sundek Sports Systems is well known Tennis Court Making Company in INDIA, located at Mumabi. Tennis Court prepared by us are in compliance with the set international standards of size and dimension. 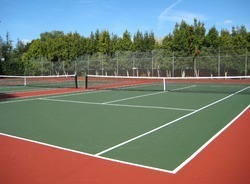 We are rated as a reliable Tennis Court making company. The variety of our Tennis Court Surfaces is made using the best quality raw materials. Size/Area Standard - 3077sq. ft.
Sundek Sports Systems is well known Volleyball Court Making Company in INDIA, located at Mumbai.